I'm sitting around the house this morning, doing some blogging and listening to recordings from an amazing food conference that happened this weekend, the Conscious Food Summit. It's free and full of great information without being preachy. If there's one thing most people can't tolerate, it's preachy vegans. Anyways, feel free to check it out. 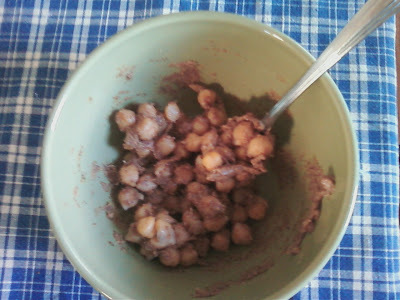 I got hungry for my morning snack as I was listening and I remembered that I have tons of chickpeas in the fridge (from a big batch I soaked and cooked on Saturday night). On Oh She Glows (yes, this one again!) there's a great recipe for a quick, filling snack with chickpeas "Chick P's and P.B.". I tweaked the recipe a bit based on what I have on hand in our kitchen. It was pretty tasty and definitely a good snack idea to have in the repertoire. This recipe makes one serving. Mix the nut butter and sweetener in a bowl and add the cooked chickpeas. Mix until evenly coated. Enjoy as is or with a piece of toast or soft bread.